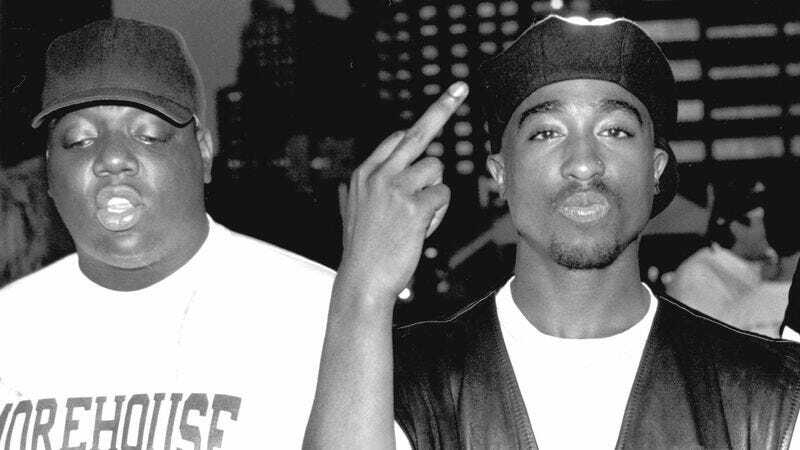 Last year, USA Network announced it would get to the bottom of the murders of Tupac Shakur and Biggie Smalls with the true crime series, Unsolved. The small-screen investigation is officially moving forward now that the two leads have been cast. Variety reports that Marcc Rose and Wavyy Jonez have been cast as Tupac and Biggie, respectively. Rose has a bit of a leg up on Jonez—he’s already played Tupac, in Straight Outta Compton. Jonez is a relative newcomer, and was found during a nationwide search for a rapper/actor to play the Life After Death artist. Jimmi Simpson and Bokeem Woodbine have already signed on to the Unsolved pilot, which also stars Josh Duhamel as former LAPD Detective Greg Kading, who led multiple investigations into the murders of the two music icons. Kading is executive producing the series Mark Taylor and Kyle Long, who also co-wrote the pilot. The Unsolved pilot is not to be confused with the cinematic manhunt that Forest Whitaker and Johnny Depp are embarking on in Labyrinth.